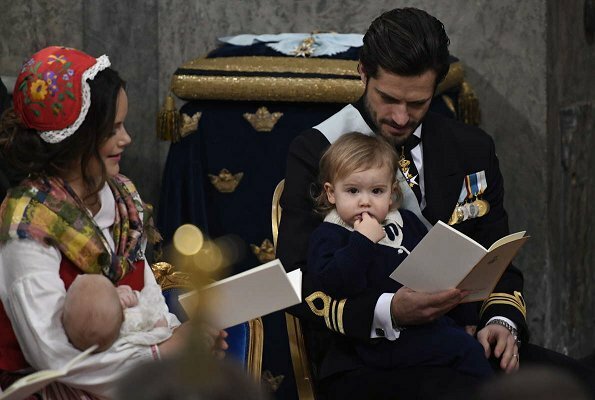 Today, on December 1, 2017, the second son of Prince Carl Philip of Sweden and Princess Sofia, Prince Gabriel was baptised at Drottningholm Castle Church in Stockholm. 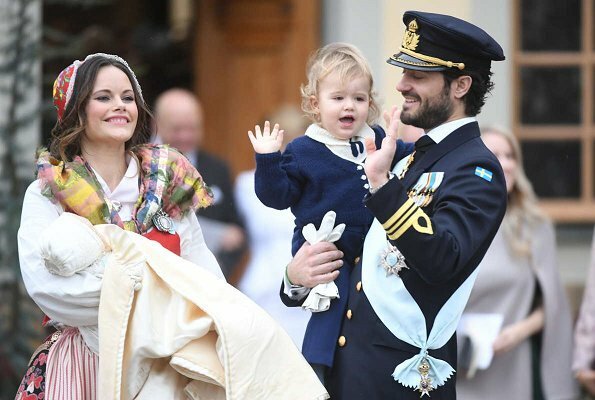 Princess Madeleine, Sara Hellqvist, Oscar Kylberg, Carolina Pihl and Thomas de Toledo Sommerlath became godparents of Prince Gabriel. 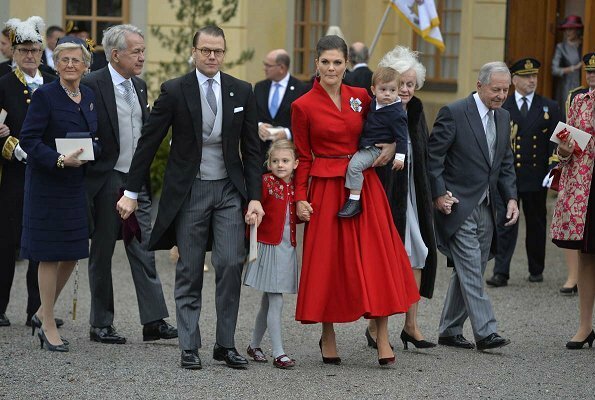 King Gustaf, Queen Silvia, Crown Princess Victoria, Prince Daniel, Princess Estelle, Prince Oscar, Prince Carl Philip, Princess Sofia, Prince Alexander, Princess Madeleine of Sweden and Christopher O'Neill attended the baptism. OK, I have to say it, what on earth is Sofia wearing and why? I believe that she wears the traditional dress of some swedish region. She wears folk dress from Dalarna because her son gave title of Prince of Dalarna and also Sofia cames from this region. Agreed what is that??? Her husband so regal and she looks like shes coming out of the fields from work. I do not understand you, Lucy. I think Sofia looks beautiful in this traditional dress. And I also like this dress itself, beautiful colours, and it shows her bond to the country. Victoria looks gorgeous too and Little Estelle is so cute and charming, as always! I agree with Lucy and Vanessa especially given what mother's have worn to past christenings. I could understand it if she had worn something similar to Alexander's christening. Unfortunately, maybe she took bad advice from someone. It is a nice touch. But not to a christening. I hope she didn't wore that in the official photos. She should have worn that when she was in Dalarna. It was a nice touch but again... not to a christening. There is a big difference between Sophia and everyone else. Sophia grew up in this region and now her son is the Duke of the region. This is completely different to Madeleine and Victoria. They do not have these connections to a region (there connection is to the whole country) and each region has their own design. Phoebe, again, it would have been nice to wear for a diferent event. Christening is about the child's connection to christ. Not dukedoms. Okay, Sofia is wearing a traditional costume, I assume it is from the region she grew up. She looks so happy and radiant that it almost doesn`t matter what she is wearing. The outfit of Madeleine is strange in my eyes - her coat has something from a dressing gown an her hairstyle suits to this .... Victoria Looks great in red, stunning colour especially for this time of the year, but her skirt is definitely too long - and in the video one could see that she has hassle to walk elegantly with her Mega-heels. Okay, it is even more difficult with Oscar carrying on her arms. Queen Silvia`s MakeUp ist too strong, I think, she looks "painted". For me, one of the most elegant ladies here is the sister of Sofia, that is one of the Godparents! She wears the typical dress of Dalarna! I am curious also. What part of the country is this dress from? It is different than the national dress that is worn for their National Day? Her son became the Duke of Dalarna, the region in the western part of the central Sweden - very appropriate as well as she grew up in this part of Sweden.I think quite sweet. Yes, sweet it is. Thank you for the info! Gabriel is the duke of Dalarna and Sofias dress is a national costume of Dalarna. In Scandinavia we use them a lot. Sofia démontre beaucoup de délicatesse et de respect pour sa région, pour le titre de son fils et pour ceux qui ont pris cette décision. C'est une célébration empreinte d'amour et de simplicite. A lokal folklore costume from the region where she grew up. Its very traditional and considered as formal as white tie. Many European countries have traditional garments referred to as “National dress or costume”. This traditional garment was originally used as a form of identification. It signifies where the person comes from i.e. country, specific region, county, parish etc., the person’s status within his/her society, whether he/she is married or unmarried, etc. Nowadays it is used mostly as a ceremonial garment on special occasions. Google national dress of Sweden, Estonia, Denmark, Norway, etc to see the huge array of these lovely garments. What on earth is Madelaine wearing? She looks terrible. She is wearing coat costing 14 510 € and dress costing 5 600 €. Total price over 20 000 € did not bring her really any style. Marianne; my source was Finnish paper. I do not care at all how much she puts to her clothes, I am sure she herself and her hubby have enough money, just that big price does not mean style. Finnish paper probably quoted SvenskDam's price who got it wrong. And just because you don't like some styles doesn't mean that everyone thinks so. I found Madeleine's appearance very beautiful and chic. She should have taken off the coat inside the church but neverless what was wrong with this style? Very lovely maternity fashion in my opinion. Yes, her outfit may have mind blowing price...but then the designer clothes don't come cheap because of particular design, they are handmade that is more time-consuming than mass production, these clothes are also made of the very best materials. That can not be cheap unless you start to save from somewhere, e.g from great craftspeople, materials, etc. This is one of the reasons why I so much enjoy watching royal ladies, so we get to see so many different styles, from Zara to Chanel, from H&M to Elie Saab. I think it would be so boring if all of them only wore fast fashion brands. Marianne, her fur is made of unborn calfs! Very brutal, not chic. Only yet unborn svakara calfs have this curly, smooth fur. Zucchina, believe me I already knew that its a fur coat she wore! I know that today its natural to hate/dislike fur coats, leather shoes, leather boots, leather handbags, etc. Lots of people no longer want to wear clothes made of natural silk, cotton and wool. They wear clothes made of synthetic fabrics rather than natural fibers. Daß es die Tracht von Dalarna ist, läßt dieses besondere Rot der Kappe vermuten - aber muß sie dazu wirklich einen pinkfarbenen Lippenstift tragen und hatte sie keine Zeit mehr, ihre Nase zu pudern ??? Sofia´s dress is from her birth region and also what dukedom Gabriel got. Little maybe unexpected but why not, these national dresses are valid up to white tie events basically. I think Sofia looks radiant. She could have looked radiant even if had potato sack on, so happy she also looks. Victoria looks stunning, that red color is perfect to her, nice up-doe and accessories (family). Silvia looks also very good. These pale colors are very becoming to her. Madeline looks just weird and untidy. I must say: she was born in Stockholm. She lived as a child in Dalarna before she moved back to stockholm at 18. I dont think anyone can say that she's a typical country girl, like for example, Daniel. He actually was born and raised in the country. She moved to stockholm to work in the gym industry. CP Victoria looks too much like Papa Noel, just an opinion. What a brilliant touch for Sofia to wear the national dress of the region in which she grew up and her son's dukedom. It's so beautiful and colorful in dark December. Sylvia and Victoria look so elegant. Love Alexander's little wave. Chris looks as bored as always. Agree Lizzie he always looks like he's been dragged to events under sufferance and would rather be home watching the football with beer in hand. Victoria looks lovely the best of them all. Little Estelle too I just love that little girl. Im sure its not fun for him. He doesnt understand anything that is being said. Like me listening to a hindu ceremony. Do you know Chris personally? Of what I heard, he can understand swedish right and can speak quite a lot. For example, one could see that he sang in the Swedish hymns in the ceremony. He does not no swedish a lot. He tries to single the hymns. When they went to gotland because of Leonore, the interviews were in english So that the would understood. He cant speak swedish. But you for sure knows everything! Lucky you. Victoria has the most beautiful family. Estelle already has such magnetism & even a grumpy Oscar is still adorable. I do love Sofias decision to wear traditional dress, especially given it's significant to her and her son! Oscar look sad. Maybe he was sleepy. The Decor is very nice indeed. Very x-mas. Madeleine could have done better with her outfit. In Sweden you can wear this type of traditional cosume in any circumstance. Gala, church, weddings, funerals... and we have many varietys. My own mother made many, for family and friends, and wore her own many times. My sister wore one when she married, as the rest of the wedding participantd and many guests. Fun but not to a royal christening. Royal being the key word. I wish they would have brought Lenore. I always love watching Chris try to cope with that rambunctious, energetic little girl. I guess they were just too tired to cope today. Miss you Lenore!! I miss both of those children too! Their absence created a void. However, I can understand why they were not present. Madeleine was in a formal role as godmother and in this position could not properly keep an eye on her children. And as for Chris, it would have been too much for him to cope with the two of them during the christening. One he could handle for this, but not two. I loved Victoria's dress. The color of Madeleine's outfit washed her out. And it also looked like she was wearing a coat indoors. Maybe it was a long jacket to compliment the dress underneath, but the impression was that of a light outdoor coat. But whatever she wears, she is a beautiful woman. Both Madeleine and Victoria look so beautiful. Victoria looks fantastic in red. I wish Madeleine had choosen also something more colorful but neverless she looks so serene and beautiful. How much Alexander has grown. Missed seeing Leonore and Nicolas. The national costume or in this case the local costume is equal to highest level of dressing in Sweden. They are normally handmade so lots of work goes into these garments. Personally I'm not so fond, however Sofia looks RADIANT in this outfit, plus all the nice gestures to her home region Dalarna, of which her son is also duke. I think a great choice for this occasion. Silva is super elegant with superb choices of accessories and jewelry, Victoria amazing in red with full skirt, the King, CP and Daniel handsome as ever. What the.. Madeleine? What happened? I think a major drama must have occurred to turn up looking like that! Just nuts! Her hair does not suit the traditional cap..
You are so correct. Her hair style is very inappropriate. She was eying the camera all the time in the beginning. Sophia's mother's "head gear", what else can I call it, is inappropriate for her figure and age. Looks silly. Give a break ATL, what has Sofias mother's figure to do with her head piece? You are just insulting, nothing to do with the fashion. Fashion, ou dress appropriately for your age and person, size,height, and dress. She,SH's mother was incorrect. Madeleine is the most beautiful woman, but what a hot damn mess she is today! Estelle is best described as the star performer of the family! Estelle is the little sunshine, always ready to give her all, and, with a smile. I can't help, but little Oscar looks ill. He is so pale and has thick eyes. Hope, everything is OK with him. I think so, too. Perhaps fever? I think Sofia looks lovely in the traditional costume. Love the colours and the acknowledgement of both her son's title and the region she grew up. Victoria looks fantastic - love both colour and style. The Queen looks good in the blue. I don't like Madeleine's look at all but I quite often don't like her clothes so nothing new there! To inform some of you who want to complain and criticize tradition, Sofia is wearing the traditional folk dress of the area she came from, Alvdalen, which is part of Dalarna. Relatives of Sofia hand made the outfit so it means something very special to her. Her son, Prince Gabriel, being christened is Duke of Dalarna. I think Sofia wearing this folk dress is wonderful. It brings where she was born and her new son's position as Duke of Dalarna together at his christening. I think Sofia looks beautiful in her folk dress and knowing the meaning behind it makes it even more special. No one is critizing tradition. I, and i will speak for myself, dont see that is appropriate to wear this in a royal christening. This would be awsome to wear in dalarna. She went many times there, she could have worn this. It would be nice. Just not appropriate for a royal christening. No one is saying isnt a nice touch. A christening isnt about what dukedom u have but your connection with god, Jesus crist and your connection with the Divine as a hole. Really Raquel, as much as you like to peck Sofia (five or six comments in this one tread only), national dress is indeed appropriate to wear in all festives from smaller occasions up to white tie events. Church is very appropriate place to it. To me your last sentence does not open at all, how come Valentinos, mini skirts we have seen many times in church events etc. be more connected with God than humble national dresses? - u also made many comments already. - valentinos, etc are not connected with anything. So its very much neutral. National dresses are not. There's the difference. - Mini skirts are definetely not appropriate either. That we can very much agree. National dress is not neutral??? What??? There must be some deep difference ethnically how to think national dresses, there is no other explanation to your comments. To us, Scandinavian people, national dress is seen more like unity with god, home and country. No political meaning at all. There is no dress what praise your own country more and that was definitely what Sofia meant. We have seen here dozens of times for example Norwegian royals at church in national dresses. Nobody, not even you, complains. But of course Sofia can never do anything right. You may dislike someones clothes but to react like you do with dozens of negative remarks in the same thread, again and again to all threads of Sofia, is something else. That is pure pecking, mean and nitpicky. No matter how many dozen emojis you put to your messages. Again telling us so much about yourself and nothing about Sofia. National custumes are not neutro in terms of being appropriate to wear in all occasions. Thats what is being discussed. Not being neutral in terms of what it represents. I never seen the norwegians in custumes at church. I certainly never said it was good, did I? You may day its says a lot about me, I dont mind. I very much disagree. If its an attemp to influencie my opinions, it will not work. My opinions are based on my taste and facts. Period. Rachel, your comments have mostly nothing really to do with "facts". Actually there came quite a scandal to Sweden after these christenings, not for Sofia but for Madeline. That in your opinion "very neutral Valentino coat" she had was made from 3 days old (some sources tell unborn) karakul-baby lambs. What made animal right organizations and green party mad. Such a coat was seen very reckless and pompous. Well kudos to Sofia for embracing the National dress then, it explains a lot with the Darlarna connection, I think it's quite brave actually as I've only seem them wear something like that on their National day. She looks positively radiant and they a couple very much in love. At 1:06 in the video, there was a point in the ceremony where the King himself bestowed upon Prince Gabriel a light blue sash. It was very nice, with Sofia wearing the traditional outfit. It's good to know her relatives specially made the outfit for her, thank you for mentioning that, KarenAR. It was also sweet the way Princess Estelle was included in the ceremony, with the blessing of the water. Fashion? 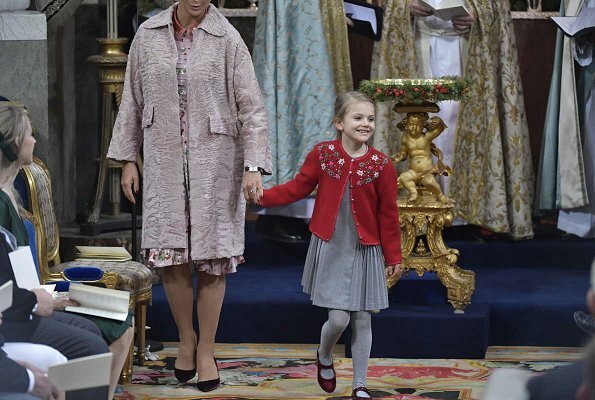 the rules seem to be changing since that is a Valentino coat that is shorter than the dress on Madeleine. Victoria's outfit is excellent. The Queen as always, impeccable. I liked the cape Sofia's sister Sara wore. Very clever styling with the buttons. I loved that Princess Sophia has worn her traditional costume and its connection to both where she grew up and Gabriel's duchy! From what I have read online it seams that in Scandinavian countries this is quite common. I believe that if Madeleine and Victoria had married into the royal family and came from a Swedish county they would have done the same thing if their child was given the duchy of their home county!! The only reason the haven't is because they do not have that connection like Sophia! Not quite true. No royal woman that married into the family ever wore a traditional costume to a christening. It was the first time in over 200 years of dynastie. Not sure where youre getting your info. 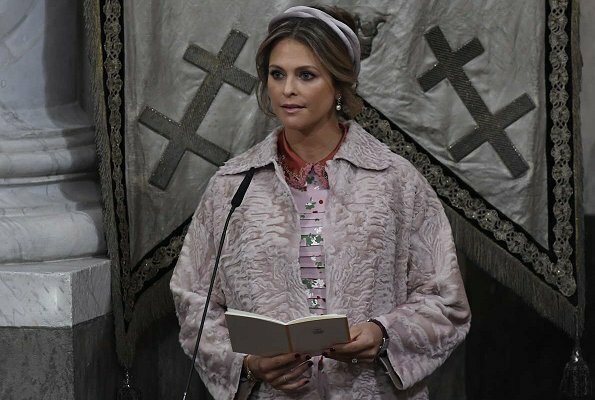 "Two things really surprised - Princess Sofia's unusual dress and the choice of music. Unlike its two sister-in-law crown princess Victoria and Princess Madeleine, both of which are significantly more traditionally bound. 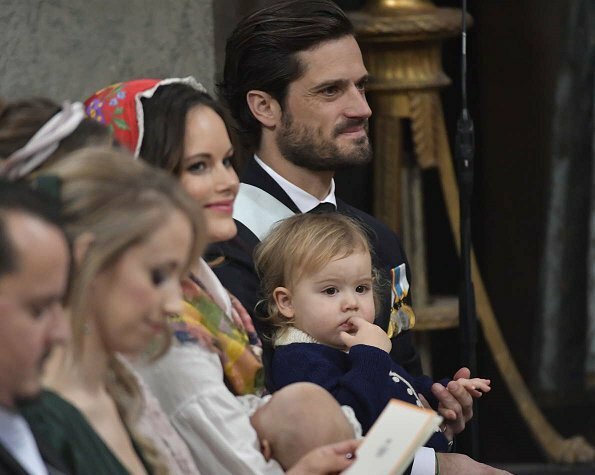 Even when the protagonists of Prince Baptist Prince Gabriel, Princess Sofia and Prince Carl Philip entered the Drottningholm Castle Church, there was a slander through the congregation. 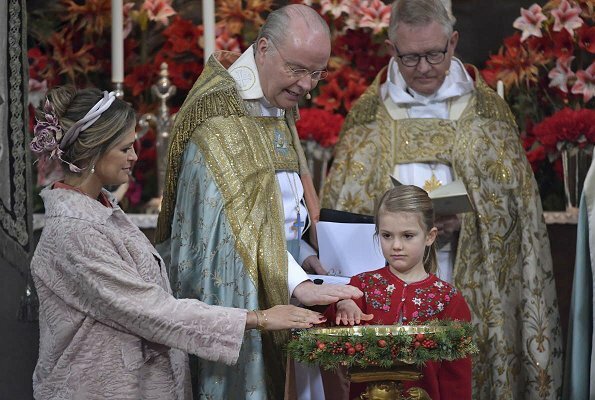 Sofia was wearing folk costumes - and, as far as I know, the first time in history, a royality is wearing folk costumes on a baptism." This is an article published by a swedish royal repórter. U can believe what people day on the internet. However, several posters of Scandinavian origin have said that wearing traditional costume is akin to wearing very formal wear so I don't see the problem. The fact that no other member of the Swedish Royal Family has done so at a baptism doesn't make it inappropriate. Raquel the difference is that Sophia is the first Swedish born and bread women to have married into the family! Silvia is not Swedish and neither are those who came before her who came from other royal house throughout Europe. There is clearly a big difference. Lol, those women still have a dukedom, children with dukedoms, and some ( Silvia ) were actually commoners too. Sofia didnt even wore the custumes in dalarna. Sofia didnt even born in dalarna. She lived there for a few years until she was 18. There is no big difference. Actually Sofia´s relatives from mothers part have been living many generations just in Dalecarlia and are of course living there still, parents, grandparents, other relatives. Her parents lived only few years away in Stockholm and returned there back. Sofia´s roots are really rather deep there. I think Sofia looked beautiful and happy and adorable, as did her husband and their 2 smiling kids. Both set of parents also looked good, I liked Queen Silvia's dress and Sofia's mother dress. 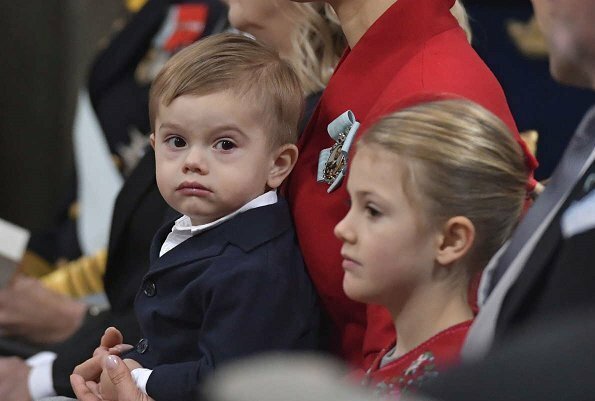 Victoria looked regal in red and Estelle very cute and grown up, but little Oscar is still grumpy, does he ever smile? His dad always smiles. I give Sofia a big plus for wearing national costume, she surprised me in a positive way. This outfit is much more valuable than cltohes of any designer, you can't compare this; tradicional costumes represent the history of a region. "...ihre Nase zu pudern...", wirklich? Sie sieht zaubernd aus und die Tracht war eine gute Ueberraschung. Ich habe gesehen, dass Sie, Nanni, immer etwas schlechtes ueber Sofia schreiben wollen. Madeleine hat immer ein guter Geschmack gehabt aber dieser Pelz aus der noch ungeborenen Kälbe ist nur schrecklich. Another minor royal I hope he gets a good education. 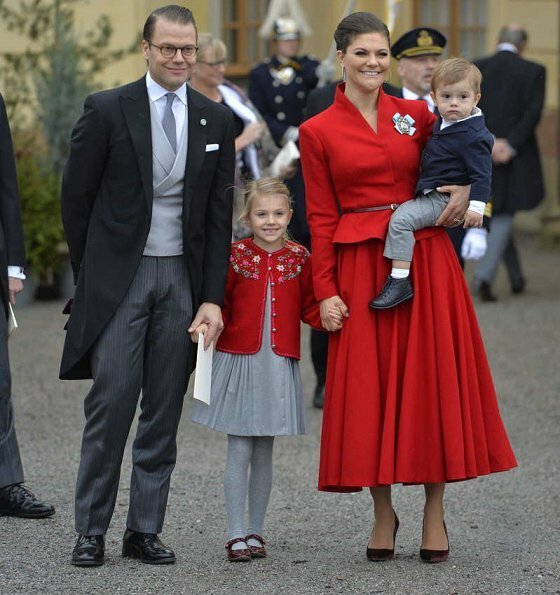 Estelle and Oscar as well as Crown Princess Victoria, his older brother are ahead o f him. Nice service, except for the outfit that Sophia wore, a very serious break with tradition. You want to be a royal, act as one. Thanku. Finally another person that gets it. MHO: sometimes is good to firmly stick to the tradition and sometimes not. We can't really say what was the fact in this case - let's next generations decide about that. Maybe this will become new tradition, what do we know? But in any case - traditional costumes are to respect and honour in every country. Masha, my country also has traditional custumes. My grandma, for example, is from Barcelos. A city historically important in the country with their own traditional custume. U will now see me or my mother wearing that. My grandmas memory is honnour in other ways. People/countries are more than custumes. Custumes is just that people wore. One of the music of the batism is a south african tradicional song. What does that have to do with dalarna or sweden? At first I really was surprised at Sofia's outfit but I now realize, from comments above, that it is not unusual in Sweden to wear national/regional dress at such an event. If that's the case, okay. I just love Victoria's family in coordinated red and grey outfits. She looks great and Estelle is such a joy to see. I do wish we could see little Oscar smile a bit. It's a pity that he seems to hate the cameras. Madeleine, frankly, looks dreadful - frumpy, matronly, no style at all, and that cost how much?????? What a mean petty comment. He'll get a good education, better than yours for sure and Sofia's outfit was just as Masha said, better than a designer one, much more meaningful. She looked adorable. I always wear my dress at funerals, christenings and sometimes weddings or when I perform as a musician.In Dalarna they very often wear it when they marry.My sister in law in Dalarna always wears it on christenings and funerals.That's how it is. Victoria looks stunning, I love her ensemble and while I was a little surprised by Sofia's outfit, I think it is a lovely choice, something the people of the area will appreciate and something her son will be able to look back upon with pride.